The Occupy Wall Street movement has challenged the physical manifestation of the First Amendment rights to freedom of assembly. Where and how can people congregate today? Forty social scientists, planners, architects, and civil liberties experts explore the definition, use, role, and importance of public space for the exercise of our democratic rights to free expression. The book also discusses whose voice is heard and what factors limit the participation of minorities in Occupy activities. This foundational work puts issues of democracy and civic engagement back into the center of dialogue about the built environment. 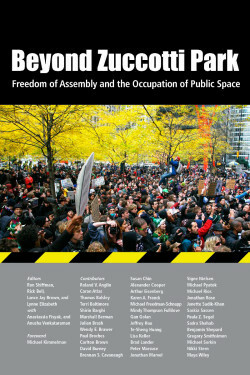 Beyond Zuccotti Park is a collaborative effort of Pratt Graduate Center for Planning and the Environment, City College of New York School of Architecture, New Village Press and its parent organization, Architects/Designers/Planners for Social Responsibility. The book is part of an open civic inquiry on the part of these organizations. The project was seeded by a series of free public forums—Freedom of Assembly: Public Space Today—held at the Center for Architecture in response to the forced clearance of Occupy activities from Zuccotti Park and public plazas throughout the country. The first two recorded programs took place on December 17, 2011 and February 4, 2012.